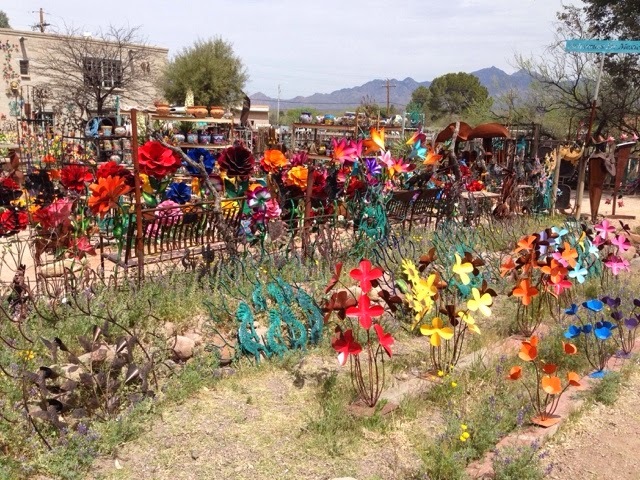 Today I decided to go to visit the self proclaimed artist community of Tubsc, AZ. Situated about half way between Tucson and Nogales. About 40 miles drive to the south. The stop was recommended to by me by Dan, the man who has a camper van like mine, at the casino where we have been staying. Or as he put it, "It is just south of where the Boarder Patrol has it's checkpoint on I19." 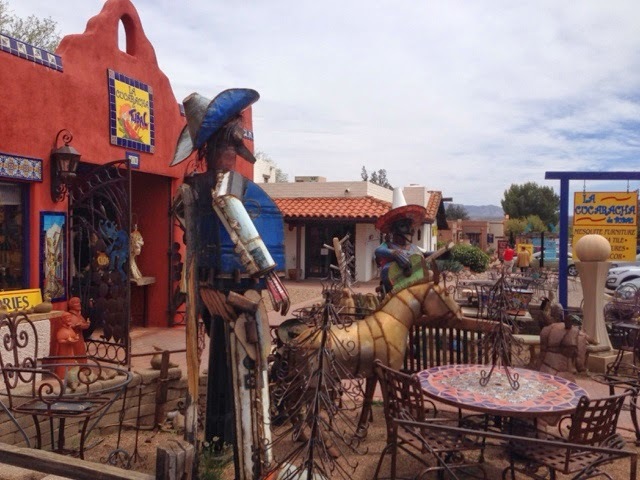 I arrived about 9:30 am to find a quaint western town with single story buildings with two main streets with lovely shops on either side of the streets for about 1/8 mile, many run but artists. 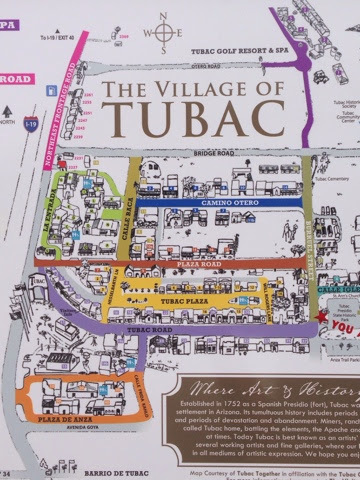 My goal to start was to drive the short distance through town to the Tubac Presidio State Park where I will find out all about the town before walking around. 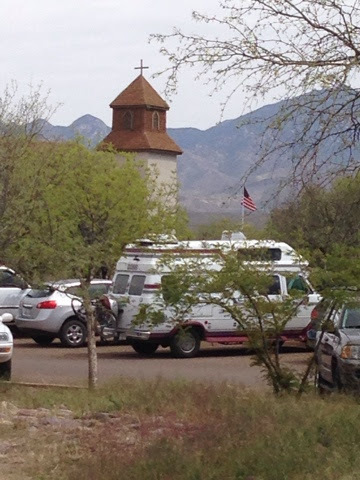 The town's Catholic Church is next to the State Park. The visitor building is relatively nondescript but when you open the door you are treated with history of the area all around you and a lovely man and woman greeters who volunteer at the site. 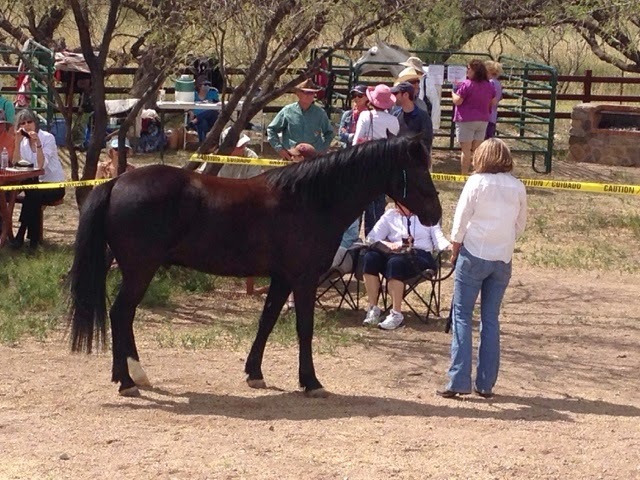 I checked in with them and paid the $5.00 entrance fee and I was asked if I was there for the "Spanish-Barb" horse display. I said no but I would like to find out about it. I watched an 8 minute video that was professionally done and provided just the right amount of background to get started on my self guided tour of the grounds and buildings. 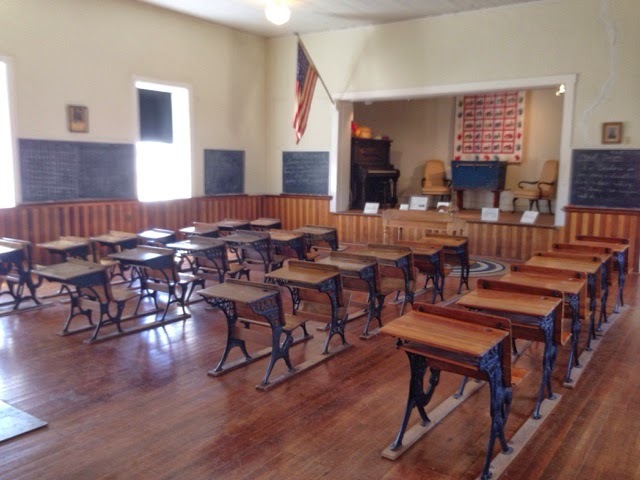 One of my first stops was the town's original school house. Then there was a view of the ruins from the original Spanish Fort. There was also a display about the archeological dig they did and some of the things they found. It was underground so you needed to take the stairs and the dig was behind glass. Then I was on to outdoor displays about domestic life when the town was first settled. 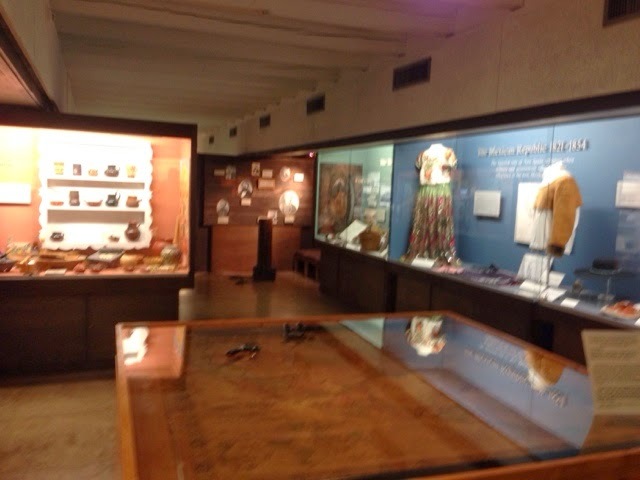 The tour brought me to this well appointed museum with many artifacts and displays. 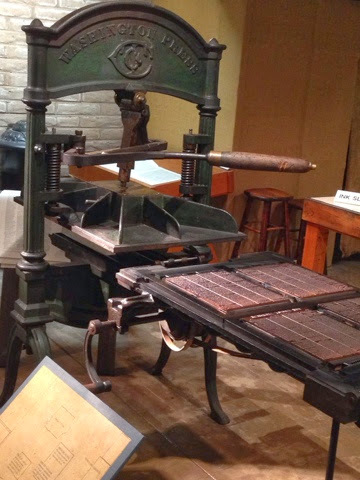 One of their museum's pride possessions is this printing press. 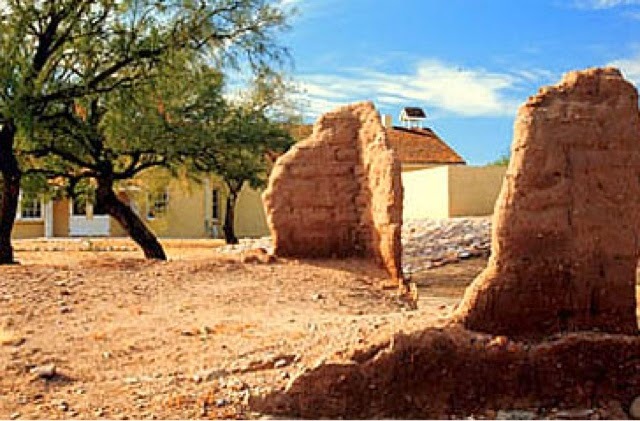 This is the original press that was used to publish the first newspaper in AZ, that was in Tubac. 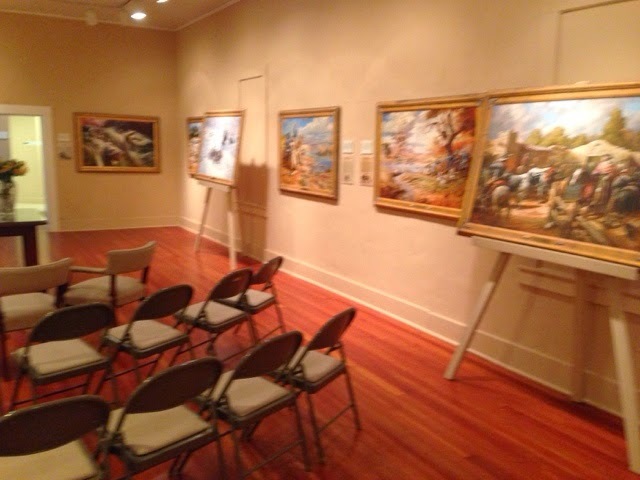 After leaving the museum, There was a meeting building that was adorned with murals of western life by William Ahrendt along all the walls. 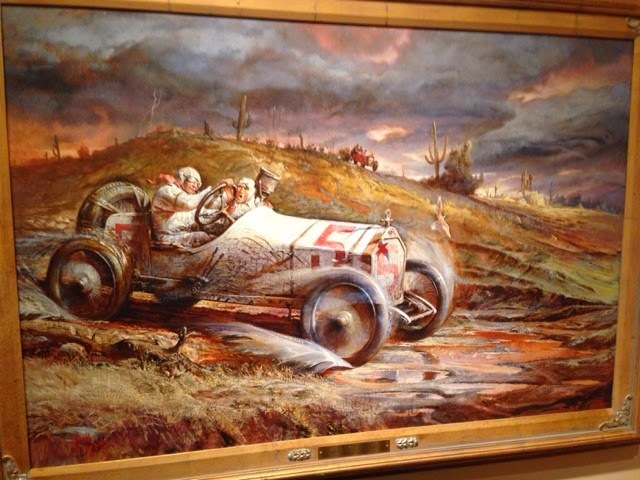 There was a large veriety of elaborately drawn paintings such as this one. 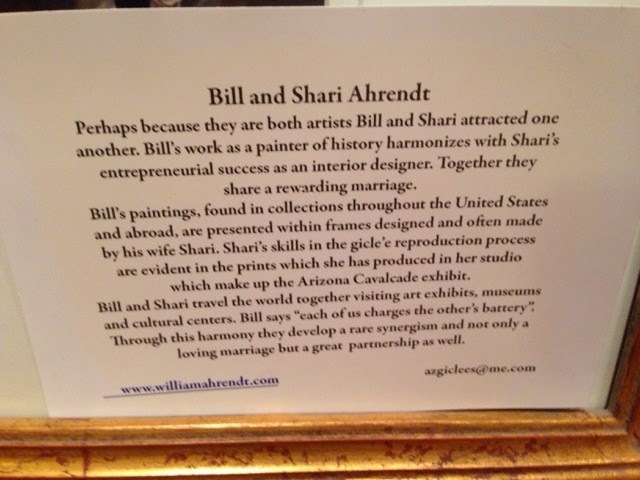 Here is the write up about the artist and his wife. 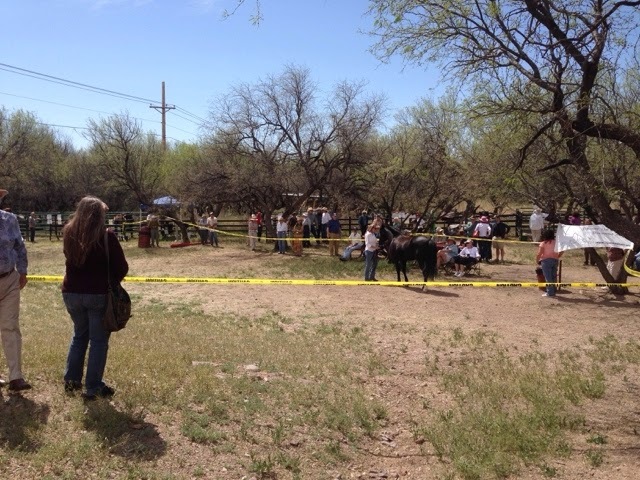 After completing the guided tour I ended up at the "Spanish-Barb" horse activities in a small corral that was set up in the property. I initially was thinking that ok "I've seen horses before. ", but I stopped to smell the roses, so to speak and the experience was well worth the moment in time. The "Spanish-Barb" horses are the horses that are descendants of the horses that the Spanish brought over with them to the Americas. I learned that these horses have a mild temperament and they are keen to one person. The horses seem to always know where their human mate is. This does not mean they can't be handled by others. They just relate to one person more. As you may imagine they are endangered. I am a bit wary of horses but they are not hyper like other breeds and they were very friendly. They are also not as large as other horses I have been around. There were a number of vendors set up at the event and as I walked throug them one caught my eye as there was a man and woman selling children's books. Having 3 granddaughters now that like books, I decided to stop and meet the author Albert Monreal Quihuis, who's family has strong roots in the area. I bought all three of his books. 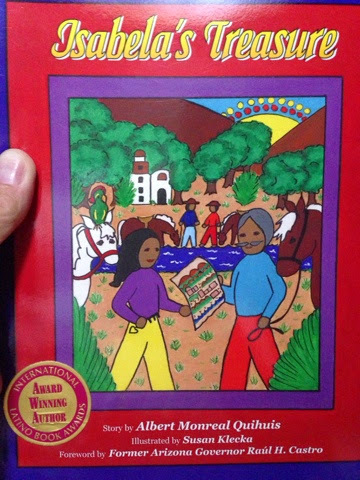 His theme in writing is to educate young children about their Mexican heritage. 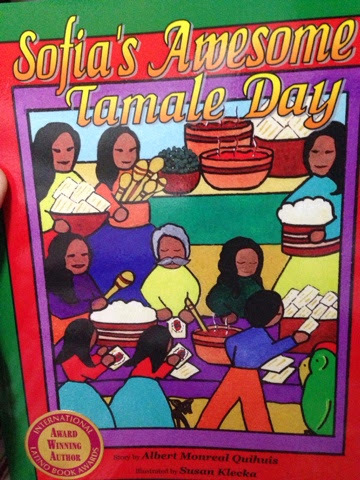 If Denise was with me she would love the books, as one of the books is titled Sofia's Awesom Tamale Day. It's about how the family gets together to make Tamales. Denise's mom is of Mexican Heratige and Denise would often say she wanted to learn how to make Tamale's from her mother. 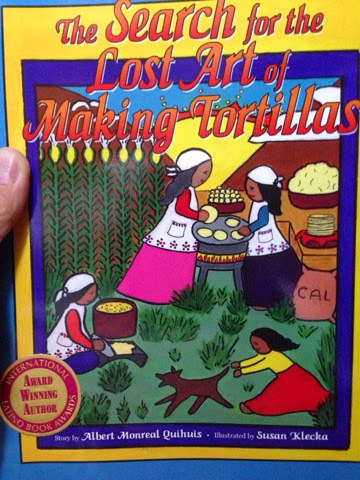 As Albert told me his book doesn't contain the rescipe the book is about the process of the family making tamales. I will give Denise all three books for her to divvy up to the three granddaughters. 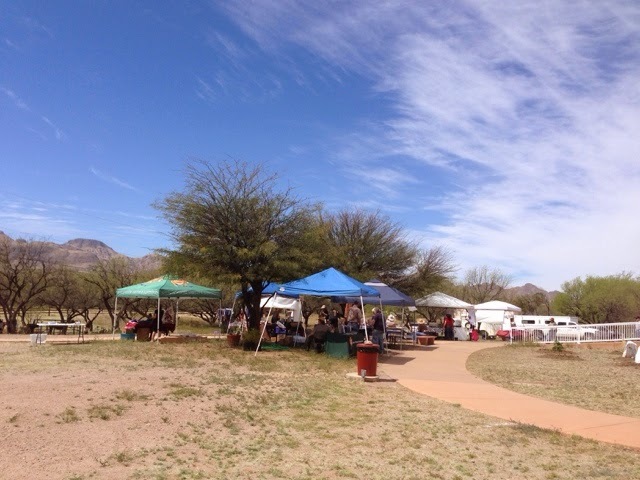 After my nice conversation with Albert and the woman with him, I checked out the food booths and one was put in by a restaurant and they were selling burritos. I bought a shredded beef burrito that was made much different than what we get at home. It was good and filling and I was glad to have tried the local cuisine. 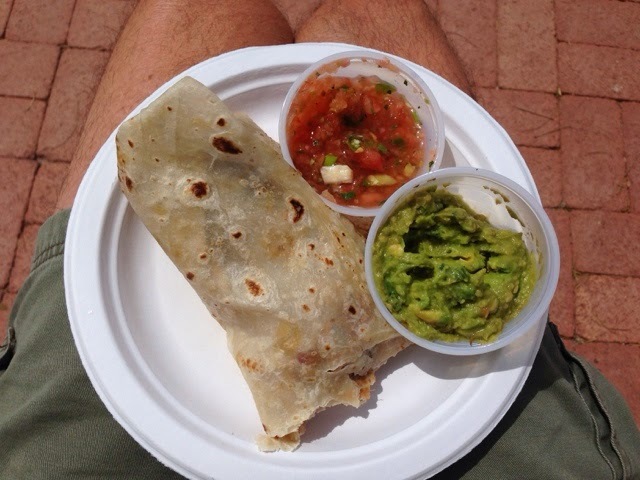 After eating I moved on to walking downtown Tubac and checking out many of the shops. 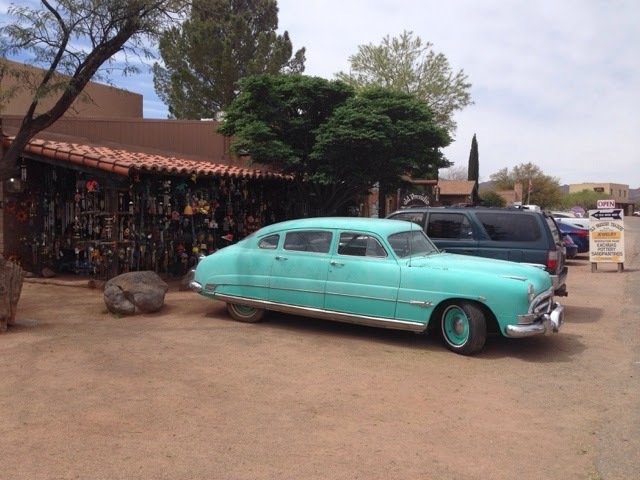 I had to get a picture of this Hudson sitting outside this shop. A man sitting on a bench outside of an ice cream shop with a small dog on his lap started up a conversation with me that must have lasted at least a half an hour if not more. I guess he was in his later 70's and asked where I was from and when I said Westminster, MA, he replayed he knew of it because of someone that he knows in the area. He was career Navy and retired many years ago. He now lives with his wife in Marana, AZ, where I play disc golf. I fact, he knew of the course because he lives in the development next to it. He was a pilot in the Navy and after he retired many years ago now, they traveled the country in an RV. He later have this up and boughtvs plane as he had his license to fly from the Millitary. He now grows fruit trees in his yard. He commented on the home owners association he has and the strict rules for doing such things. We shared lots of information until it was time for both of us move on. Although not alive I thought these yard art flowers were colorful. Then back to Tucson for the night.